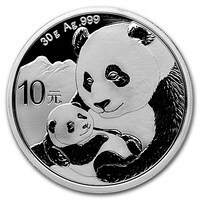 The Chinese Silver Panda coins are one of the most unique coins available on the market. These coins are favorite amongst precious metals collectors and investors because of their unique design that changes annually. This makes the coins one of the most popular coins used for investment opportunities, simply because of their notable design. 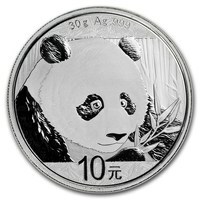 These Silver Panda coins really stand out on the international market. On the obverse of the Silver Chinese Panda coin, we can see the Hall of Prayer for Good Harvest in the Temple of Heaven in Beijing. It is displayed as classic Chinese architecture, as well as an important motif of Chinese history and religion. On the reverse side of the coin, their design includes the Great Panda - China's favorite animal, the most famous international symbol of China. The Panda gives the coin a very charming appeal and it will certainly distinguish itself from the other coins in your investment portfolio.